There is a common phenomenon in legal disputes over the value of something, be it a company, a piece of land, or a person’s expected lifetime earnings. Each side hires an “expert” who produces an estimate based on some kind of model. And miraculously, every single time, the expert for the party that wants a higher number comes up with a high number, while the expert for the party that wants a lower number comes up with a low number. No one is surprised by this. Yesterday, the Federal Reserve posted the results of the latest periodic bank stress tests mandated by the Dodd-Frank Act. For these tests, the Fed comes up with various scenarios of how things could go badly in the economy, and the goal is to see how banks’ income statements and balance sheets would respond. The key metrics are the banks’ capital ratios; the goal is to identify if, in bad states of the world, the banks would still remain solvent. If not, the banks won’t be allowed to do things that reduce their capital ratios today, like paying dividends or buying back stock. But there’s something else going on here. As part of the stress testing routine, each bank is supposed to do its own simulation of how it would respond to the scenarios specified by the Fed, using its own internal model. And—surprise, surprise!—the banks virtually uniformly predict that they will do better than the Fed. If the Fed Knows Banks Are Too Big, Why Doesn’t It Make Them Smaller? The Federal Reserve is serious—about something. 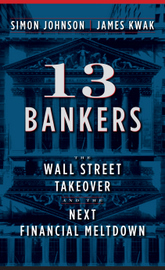 On May 2, The Wall Street Journal reported that regulators were pushing to require “very large banks to hold higher levels of capital,” including minimum levels of unsecured long-term debt, as part of an effort “to force banks to shrink voluntarily by making it expensive and onerous to be big and complex.” The article quoted Fed Governor Jeremy Stein, who said, “If after some time it has not delivered much of a change in the size and complexity of the largest of banks, one might conclude that the implicit tax was too small, and should be ratcheted up” (emphasis added). Tarullo recommended higher capital requirements and long-term debt requirements for systemically risky financial institutions. I was on vacation last week (far from Jackson Hole) when Ben Bernanke gave his widely anticipated speech. The media (see the Times, for example) seemed to focus mainly on his criticisms of the political branches and economic policymaking, which were accurate enough. But in my opinion, Bernanke drew the wrong lessons from those observations. After The Recession: What Next For the Fed? The Federal Reserve was created in 1913 to help limit the impact of financial panics. It took a while for the Fed to achieve that goal, but after World War II – with a great deal of help from other parts of the federal government – the Fed hit its stride. Today the Fed has not only lost that touch but, given the way our political and financial system currently operates, its own policies exacerbate the cycle of overexuberance and incautious lending that will bring on the next major crisis (and presumably another severe recession).